While the politicisation of Russian music in the early part of Soviet rule is well known, work produced after the thawing in cultural policy which followed Khrushchev is less familiar. The program presented by the Moscow Contemporary Music Ensemble during their recent Australian tour featured a diverse and essentially internationalist vision of Russian musical composition and performance culture. A spectral work by France’s Tristan Murail sat alongside an intense, post-serialist composition by Edison Denisov, while Alexei Sioumak playfully referenced musical history and a work by Dmitri Kourliandski featured droning and textural flourishes. The overall tone was of austere rigor, a set of musical forms requiring close concentration. Comedic or theatrical touches tended to be muted by the uncompromising virtuosity and focus of the ensemble performance. The instrumental combinations, in which violin and piano came together with flute and clarinet, but also bass flute and bass clarinet, produced an intriguing overall sonic palette, including scrapes, buzzes and sharp attacks balanced by extended breathing. Trio for Flute, Bass-Clarinet and Piano by Denisov (MCME’s patron and one of Russia’s leading composers), opens with layered streams of material producing a strong sense of flow as each stream successively enters and is joined by others as it rises and falls. Moving along with surprising rapidity, the work develops a kind of ecstatic density that embraces the listener. While individual lines sometimes become quite sparse, the overlap and the exchange of material among near complementary lines means that the piece never really relaxes. Not quite an urgent work, it has an engrossing edginess, both rhythmically and in being neither fully dissonant nor harmonically resolved. Works by Sioumak and Beat Furrer (Austria) are no less rigorous, but their reception depends in part on listening past the musical material and reading their musicological allusions—essentially postmodern strategies with a musical palette otherwise far from that typically associated with postmodernism. Furrer’s Lied For Violin and Piano (1993) takes a micro-fragment from Franz Schubert’s melancholy Winterreisse (1827), looping it in a delicate set of echoes or calls-and-responses between violin and piano, stretching it to breaking point. Pedalling keeps sparse piano strikes floating throughout, while the violin attacks aggressively before each pause, the bow often coming in sideways, yielding scratching and a painful edge to the sounds before each short silence allows the work to again open out. If the work never seems to fully start, it creates a subtle landscape of gorgeous fragments portending emotional decay, just as Schubert does. Sioumak’s CI.Air and Polka For Flute, Clarinet, Violin and Piano by contrast takes rather vibrant elements from the Eastern European polka and, in the words of MCME’s manager Victoria Korshunova, “dampens the normally joyful mood…using a rubber eraser preparation” in the horn of the clarinet, producing a slightly buzzing, low voice. Stark, long in-and-out breathing leads into the piece, but later the dampener is removed. The emergence of gypsy-ish music delivers a wonderful dancing lightness, the virtuosic tendency of that tradition evoked in a maddeningly complex rhythmic clarinet line. In a work apparently fused by Sioumak from two separate works, the polka does seem to have won out by the finale. A publicised newly commissioned piece by Sydney’s Michael Smetanin was in fact a reworking of a 1990 composition, Spray. While I was disappointed, it’s always a treat to hear Smetanin’s work performed live. It opens with a series of near canons picked up by each instrument. The piano soon comes to ground the piece, dropping low and offering strong, slightly repetitive lines—although the program notes by Richard Toop seem to suggest that this is the role played by the bass-clarinet. Whatever the case, Spray works via the construction of a series of blocks of material that enter and then eventually repeat or echo each other. The slightly rolling feel of the piece gives it a structural tightness, with local reviewer William Yeoman noting that it offered a “musical architecture perhaps less riven with tension” than the rest of the program. This need not be a negative observation. I found it very hard to discern structure in Murail’s invigoratingly cacophonous Les Ruines Circulaires, while Sergei Newski’s Rift For Bass Clarinet, Violin and Piano was both intriguing yet baffling. But that is rather the point. The world of art music has grown increasingly diverse since the 1960s, and it is wonderful to be introduced to such fine Russian artists who explore new possibilities without identifying with any particular school. One can only hope such diversity continues to be cherished not only in Russia, but beyond. Editors’ note. 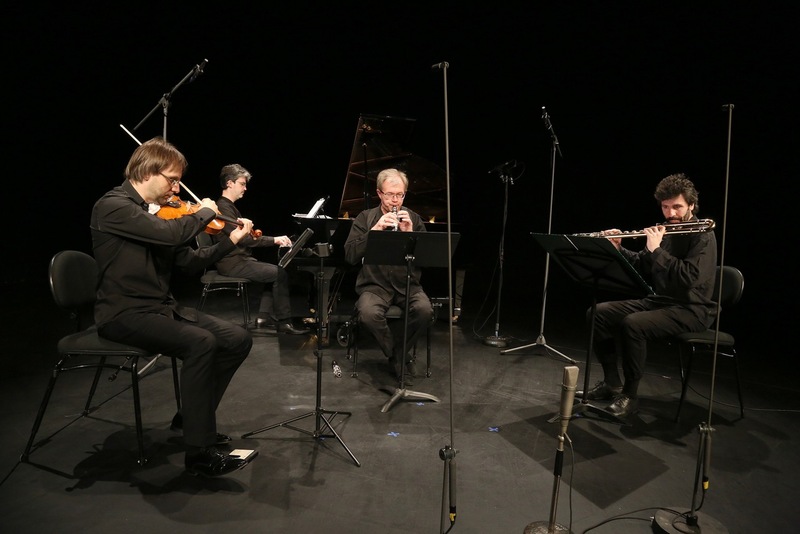 The Moscow Contemporary Music Ensemble is a leading experimenter in digital and theatrical ventures as well as a prominent commissioner of new works and performer of works by Feldman, Lucier and Reich. Read about the ensemble here and see them in a number of performances they’ve posted on YouTube, including Dmitri Kourliandski’s sussurating then turbulent White Concerto, below.